Atheneum Books for Young Readers, 9781481459600, 40pp. Every day after school, Manny saves the world from formidable foes. "This charming story marries the mania for superheroes with a potent anti-bullying message, making it an apt tale for present times. 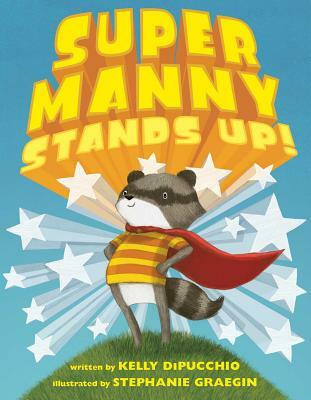 Super Manny, an imaginative raccoon child...declares out loud to the world his own fearlessness and strength in words that children will want to echo.... The whimsical illustrations and antics of imaginative Manny (and his new porcupine friend, Small One) will delight children and their grown-ups even as they take in the playfully delivered yet deeply felt message of the importance of standing up for others. Speech balloons vary in size according to the confidence level of the speakers—a highly effective visual. With great read-aloud potential, this story could be used by both parents and teachers to introduce concepts of courage and standing up to bullies from the youngest preschoolers up." "DiPucchio’s…brevity and directness should make an instant connection with readers. Graegin’s pencil-and-ink pictures seem unassuming and lighthearted…, but when the lunchroom scene unfolds, the images take on surprising and touching drama, creating a powerful moment of truth." "A highly topical subject, and the book is realistic about the difficulty of speaking up and encouraging about the value of even a small intervention.... This could be a useful discussion-opener, and maybe some young superhero fans will take Manny’s cue for superheroism in their own lives." "Sweet and sincere Manny proves he has the mettle to stand up to foes real and imaginary." "Young readers and listeners will be cheering for Manny’s heroic endeavors while subtly digesting a deeper message of antibullying. The pencil and ink drawings sweetly depict the childlike qualities of Manny and his animal classmates. VERDICT: This wonderful read-aloud is sure to be a crowd-pleaser. Recommended."